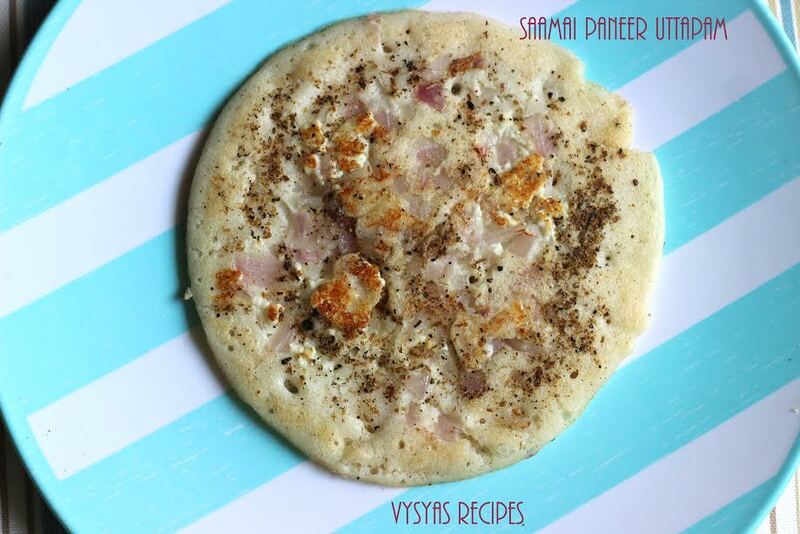 Uttapam are thick Pancakes, here the uttapam is made with millets, rice & urad dal batter with Paneer, onions & some spices topping.Little millets controls diabates.Little millet is also called as king of cereals because of its rich nutritional and medicinal value. It contains high phosporous. It especially good for people who has low body mass. 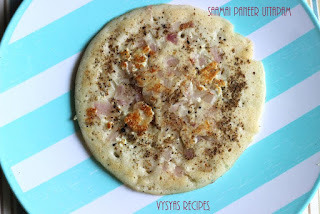 little millets is called kutki in Hindi,Saamai in Tamil, Samulu in Telugu,Saame in kannada & chama in Malalayam.Today Now we will learn about paneer uttapam. Cook Time : 2 -3 minutes per dosa. Samai Rice/Little Millets Rice - 1 cup. Idli rice - 1 cup. Urad dal - 1 cup. Methi seeds - 1 tsp. Cumin seeds - 5 tsp. Pepper Corns - 4 tsp. Onion - 8 - 9. Soak Samai Rice,idli Rice,urad dal,Green chillies & methi seeds for 4 hrs & grind into a smooth Paste with needed water & salt. Allow it to ferment for 8 - 9 hours. Now batter is Ready.Let the consistency of batter be idli batter consistency. Grate the Paneer, crush cumin seeds & pepper corns in a mortal & pestle into a coarse Powder.Chop the onions & keep it ready before making uttapam. Heat the tawa, when it is hot, reduce the heat to medium, take ladle full of batter, pour on tawa & spread in circular motion, to form thick dosa. Uttapam should be thick. After a minute, sprinkle some chopped onions, Grated paneer, little Pepper & cumin powder Gently on top of uttapam. Drizzle a tsp of oil over the dosa, once the utappam base turns Golden brown, just flip the dosa & drizzle again a tsp of oil.once it is cooked on other side remove it from tawa. Serve with idli podi ,Chutney or sambar. chop cabbage, carrot, capsicum finely, Saute in oil, till it turns little soft & sprinkle it on top on uttapam. you can finely chop cashewnuts & sprinkle it on top of Uttapam. you can also sprinkle tomatoes on top of Uttapam. you can make this utappam with kodo millet(varagarisi) or barnyard Millet(kuthiraivali) also. I am hailing this healthy and satisfying dish. Yumminess.